Dallas fans had little to cheer about on Sunday. After going down 23 points to their division rivals, “America’s Team” (which clearly isn’t true) did what they’ve been doing in recent times: They gave fans hope and just flushed it down the crapper. Dez Bryant’s long hands are the reason the Cowboys lost to the Giants this week. Not really, but it’s really fun blaming Dez Bryant for everything. The reason the Cowboys lost was because of the fact that Tony Romo threw four picks and their running game was nonexistent. You just can’t ever expect to win playing so sloppy. There is one player on the Cowboys that did exceed all expectations on Sunday, however. His rosy cheeks were in full force as he caught 18 balls for over 160 yards. He looked like the player we all have drafted over the last decade. His Week 8 performance could be considered the most underrated one of this NFL season. We saw Brian Hartline do some amazing things a few weeks ago, but this? 18 catches? Let’s give Witten some love, here. The guy played through a lacerated spleen in their opener, and now, just 8 weeks later, he’s setting single-game records at his tight end position. Did anyone from Week 8 really come close to Witten? Tony Romo threw the ball 62 times. That’s 8 more than the second highest attempt total by a quarterback (Mark Sanchez) for Week 8. When you go down 23 points early, this is exactly what you’d expect. Many are asking what to do with Romo. The short answer is that he’s a matchup play each week, as is many quarterbacks. Cam Newton was the only non-Tony Romo quarterback who threw more than 1 interception. Quarterbacks seemed to protect the ball well this week, except for the usual guys (Cam and Tony). Matt Cassel ran for 31 more yards than his teammate, Jamaal Charles. Jamaal Charles had just 5 carries for 4 yards against one of the weaker defenses in the NFL. I fully expect that to change this week against San Diego, as the Chiefs need to get their ground game going for anything to happen. 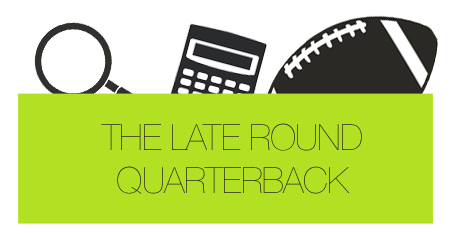 There were 7 quarterbacks who threw for 3 or more touchdowns. In Week 7, only 4 accomplished this feat. And the one player who did it both weeks? Josh Freeman. Hop on board the Freeman bandwagon! Really, though, you may want to relax – he’s been one of the more inconsistent quarterbacks since entering the league. Ronnie Brown was second at running back in receiving targets. The only back that had more was Darren Sproles. Doug Martin and Darren McFadden led the NFL in rushing attempts. They both had 29. Martin rushed for 135, while McFadden had 114. People need to get over McFadden’s performance. It wasn’t nearly as bad as you think. Jamaal Charles was the 58th ranked running back in terms of rushing yards. Bryce Brown had more yards than Jamaal Charles did. Again, I think Charles turns it around. Cecil Shorts was 5th in the league in receiving at wideout. Shorts has been more of a big play guy, but this week he became a consistent target in the Jags’ offense. If there’s a receiver to own on this team, it’s surprisingly Shorts. Clyde Gates had 11 targets at wide receiver. If you have to rely on a Jet each week, you’ve got some problems on your team. Miles Austin and Steve Smith led the NFL in wide receiver targets with 16. The difference is that Austin’s was due to quantity of pass attempts, while Smith’s was because Newton consistently looked his way. Austin had 26.7% of his team’s targets, while Smith was second in the league behind only Brandon Marshall with 42.1% of his team’s targets. Davone Bess was third in the NFL in percentage of team targets. As I mentioned above, Smith and Marshall were one and two in this category. Does it mean anything? Probably not, considering Bess caught just 4 passes for 28 yards. Michael Floyd was targeted 11 times on Monday Night. Before Week 8, he had been targeted just 18 times. Let’s blame this one on the quantity of throws Skelton had. Floyd is not a fantasy play right now. The only player with double-digit receptions was Jason Witten. And he had 18. There were plenty with 9, including Miles Austin, Titus Young and Brandon Marshall, but Jason Witten more than doubled those performances with 18 of his own. He’s back, and is a must start moving forward. Dustin Keller was targeted 11 times and had 7 receptions. I mentioned this last week, but given the fact that Clyde Gates was targeted 11 times this week just goes to show what kind of state the Jets’ receivers are in. Keller will be leaned on heavily in the passing game, making him a decent play every week. Jermichael Finley had 2 receptions. Many were excited given the injuries to the Packers offense, but Finley still didn’t do much in terms of fantasy production. He’s not worth it. Peyton Manning has thrown for 3 touchdowns in each of his last 4 games. Is anyone doubting his neck now? Chris Johnson is leading the NFL in rushing over the last 3 weeks. He’s had some very favorable matchups, so before we dub him “back”, let’s see how he does against the Bears this week. James Jones leads the NFL (along with AJ Green, Rob Gronkowski and Victor Cruz) in touchdown receptions. I’m only pointing this out because Jones isn’t getting nearly the same amount of looks as the other guys on this list. He may be a good “sell high” candidate given the number of receptions. Keep an eye out on Greg Jennings’ return. Reggie Wayne has 92 targets and just 2 touchdowns. Many want to talk about Antonio Brown, but Wayne’s ratio isn’t much better than Brown’s (1 touchdown on 63 targets). At running back, only Darren Sproles has more targets than Darren McFadden. DMC’s receiving abilities are just another reason as to why you shouldn’t give up on him this season. Tony Romo has 13 interceptions, the most in the NFL. He had 9 of them in just a couple of games, but it’s still alarming. Andrew Luck has the 4th most rushing yards at quarterback. He’s only behind RGIII, Cam Newton and Michael Vick. Over the last 3 weeks, Danny Woodhead has the most receptions and the second most yards receiving at running back. Danny Woodhead may be the ultimate bye week filler. There are 58 wide receivers in the NFL with more receiving touchdowns than Calvin Johnson.